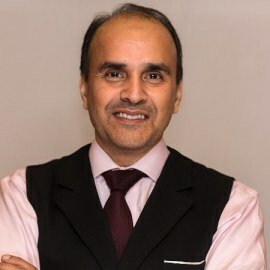 Shahid N. Shah is an internationally recognized and influential healthcare IT thought leader who is known as “The Healthcare IT Guy” across the Internet. He is a consultant to various federal agencies on IT matters and winner of Federal Computer Week’s coveted “Fed 100” award given to IT experts that have made a big impact in the government. Shahid has architected and built multiple clinical solutions over his almost 20-year career. He helped design and deploy the American Red Cross’s electronic health record solution across thousands of sites; he’s built two web-based EMRs now in use by hundreds of physicians; he’s designed large groupware and collaboration sites in use by thousands; and, as an ex-CTO for a billion dollar division of CardinalHealth he helped design advanced clinical interfaces for medical devices and hospitals. Shahid also serves as a senior technology strategy advisor to NIH’s SBIR/STTR program helping small businesses commercialize their healthcare applications. Shahid runs three successful blogs. At http://shahid.shah.org he writes about architecture issues, at http://www.healthcareguy.com he provides valuable insights on how to apply technology in health care, at http://www.federalarchitect.com he advises senior federal technologists, and at http://www.hitsphere.com he gives a glimpse of the health-care IT blogosphere as an aggregator.